Me navigator laughed when I showed him my four co-ordinates. He said that we need not go to all four as only one of these lied on the map we found. I had completely forgotten about the map in my late night puzzle solving. The co ordinates pointed to a popular island in the Northern seas. I rang me ship's bell to wake up the crew. The half sails were opened fully. We were to move at full speed towards our destination. It was obviously to get to the Blue compass faster although my Engineer suspected that I had my eyes on yet another tavern. Well, she wasn't wrong ha. I stood with a foot on my ship's bow and let the ocean breeze kiss my face. I had a strange feeling that someone was watching me. 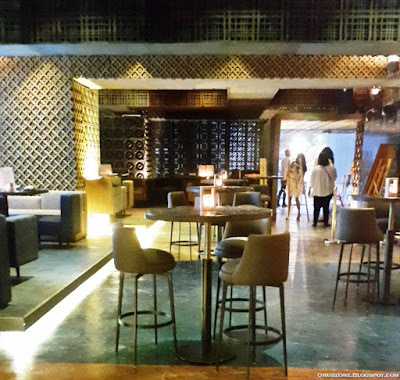 Farzi Cafe is the newest offering of Zorawar Kalra's "Massive Restaurants" group. It is the same brand that is behind Masala Library and Papaya. 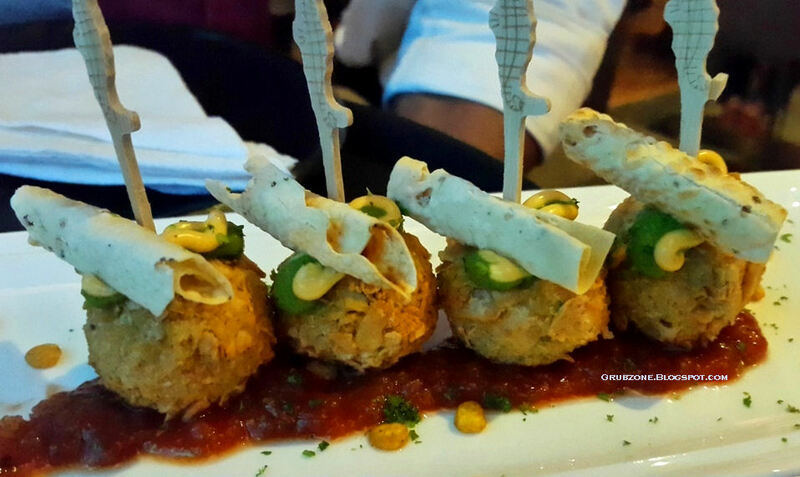 Farzi Cafe can best be described as a mix of a club, a tapas bar and a bistro in a modern debonair setting. Like Papaya, the mind boggling decor is done by Pronit Nath of Urban studio. This goes even a step beyond Papaya. I was here on the occasion of a party organized by EazyDiner. A pre-launch party is always fun and lets one sample the grub and grog before anyone else. If it is your first time and if you have any scientific curiosity then like me you will end up staring at that wall for a few minutes. This wall is specifically made to aid 3D mapping which seems to change with the music. The ambiance is dynamic and different lighting creates different scenes and emotions. Combined with the loud music and molecular cocktails, its a world of creative chaos. Chaos can be good and desirable sometimes. Every moment in Farzi is unique which will never repeat again. Farzi means fake in Hindi but its fine usage can also extend to illusions or mirages. 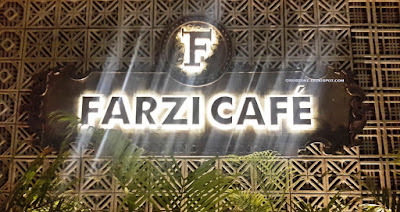 Farzi cafe is named on that notion. The ambiance with its 3D mapping and the food prepared with molecular gastronomy creates rather tempting illusions that will make one's senses dance to the waves. Farzi defines itself as a Modern Indian Bistro but its much more than that. The service was professional for the most part though I did run into a server who made me wait ages before he got my drink.Why did I come to service before food? Its because each server had a unique and a stylish hairdo. One cannot help but notice this. 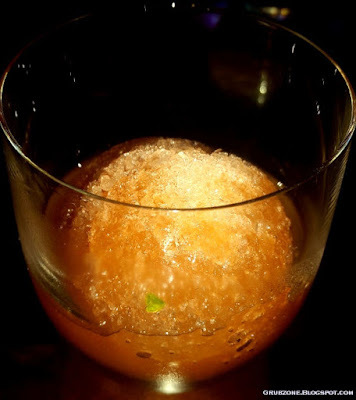 The food and cocktails were typical of Massive group's love for Molecular gastronomy. It fuses western dishes with Indian techniques or vice versa using molecular gastronomy. Its not simply adapting dishes to Indian palates but to completely re-invent them. Farzi Apple Foamintini had an amazing presentation. 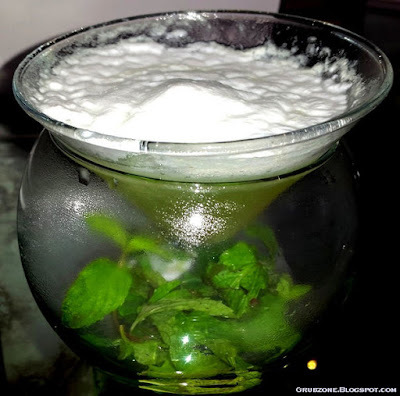 Its made out of green apple syrup, martini ingredients, mint and a foam made out of whip cream. When served, the dry ice beneath the martini cup shouts out jets of vapor in all directions. The flavor is a mix of bitter, sweet and tangy with a vanilla like undertone. The drink is mildly potent and quite seductive to the tongue. To me, this was the best of Farzi's queerly named cocktails. In fact, this will be my drink every time I go to any Farzi installations in the future. Captain : I love this drink even though it has no rum. Yum. Captain : Eh, why are you here? Where did the mates go? Don't tell me that they slithered away to other taverns. Three Muskeetear was another delectable bitter sweet drink though the shaved ice sphere felt like a turn off to me. It made a great visual effect but deteriorated the drinking experience. This drink was made of Chili, orange and Hersheys chocolate syrup mixed in whiskey. The flavor felt sweet and subtly bitter. The drink was more potent than the foamintini. I loved the flavor but the sphere should either have been smaller or not have been there at all. Captain : Ok not, Brain freeze. The Delhi Belly Pork tikka was pork belly marinated in Indian herbs and covered with a glaze made out of murabba (fruit preserve). The skin felt a little tough but beneath it was a succulent and one of the best pork bellies that I have ever had. It literally melts in the mouth. While the outer skin was sweet the inner portion was salty and fatty. A must eat if you are a carnivore and this pairs with all cocktails. Captain : Oooh this melts in me mouth. I want more... Hey! Nina. Captain : Darn it, you cute little thief. You are the only one who steals from me and gets away with it. Tempura Fried Prawns with spiced lemon foam tasted like a fusion of Japanese deep fried prawns and Mumbai street food. 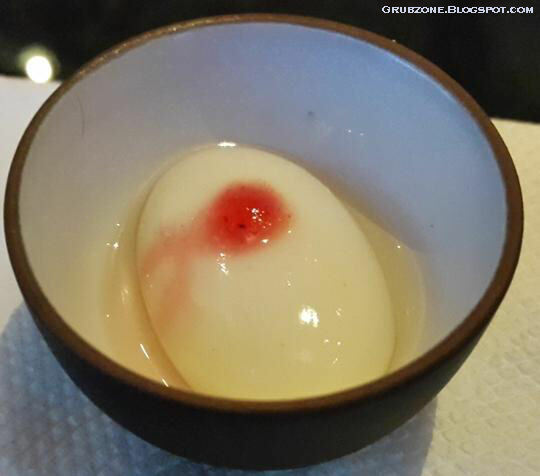 Though I am not fond of foam on my food(Don't ask why), the taste here was simply divine. The foam ensures that the flavors do not interfere with each other. Any other method will cause the flavors to mix and result into something unpalatable. 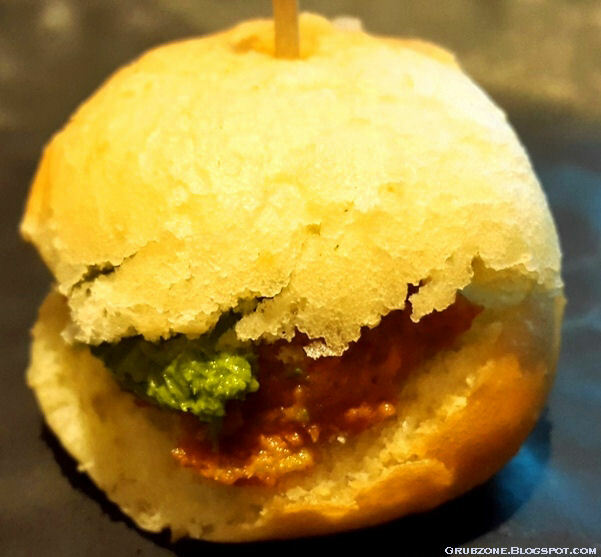 The Farzified Vada Pao was a delectable little potato dumpling. 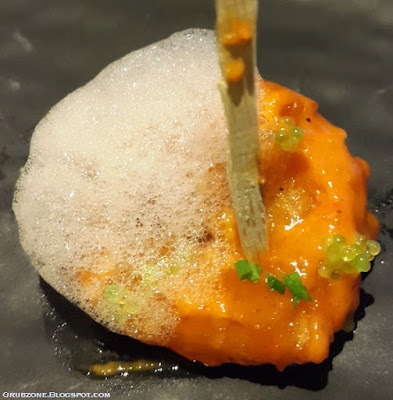 This dumpling was made out of finely minced potato and the flavor had permeated evenly to every part of this dumpling. This was a more sophisticated and a perfected form of Mumbai's favorite snack. The only flaw was that the Paos were absent on the scene. 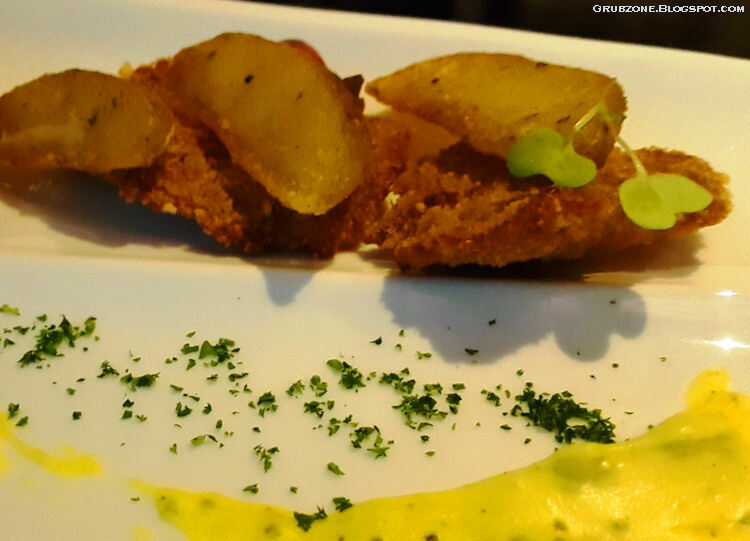 Amritsari Fish and Chips with Desi ghee Hollandaise was a dish comprised of deep fried fish cutlets served with a Hollandaise dip that used Indian clarified butter(ghee) instead of regular butter. This was a passable affair as I felt that the cutlets were a little too hard for my liking. Too much batter and too little fish. 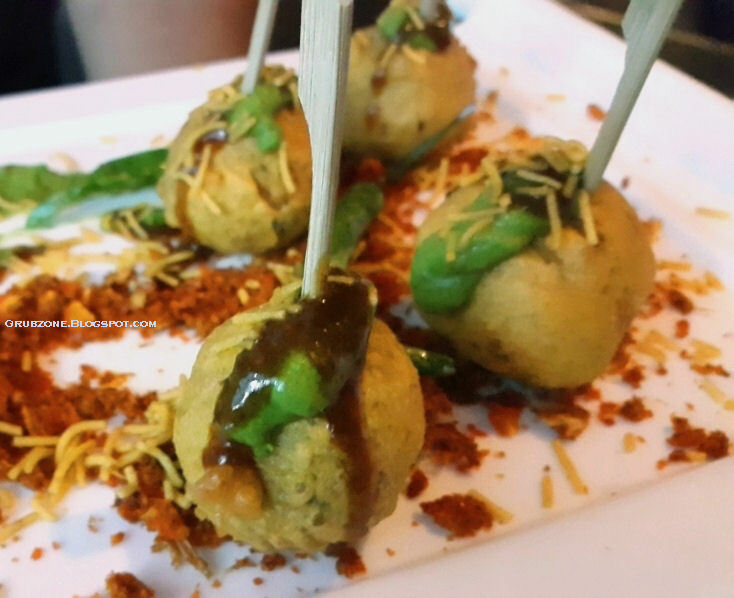 Gupta Burger was a delectable deep fried potato patty mixed with spices and served in mini buns. So it was more like a Gupta slider. 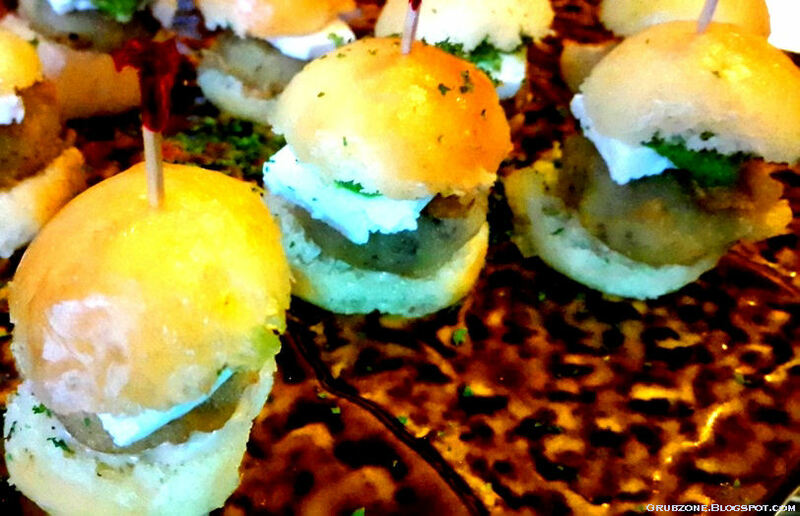 This was supposed to be an emulation of street burgers sold in Delhi by the same name. Though I have never had its namesake, I can positively attest that this was a good bar nibble. 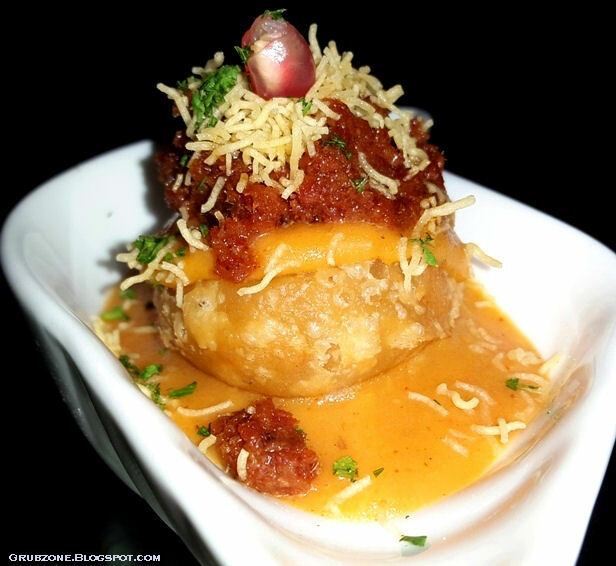 Smoked Bacon and Pyaaz ki Kachori was a fusion of rustic, smokey bacon with an onion dumpling and served with a reduction of potato jus(Rassa). This was a good novelty even though it appeared more like a stacked appetizer rather than a truly fused food. The Galouti Burger was made of finely minced lamb meat. 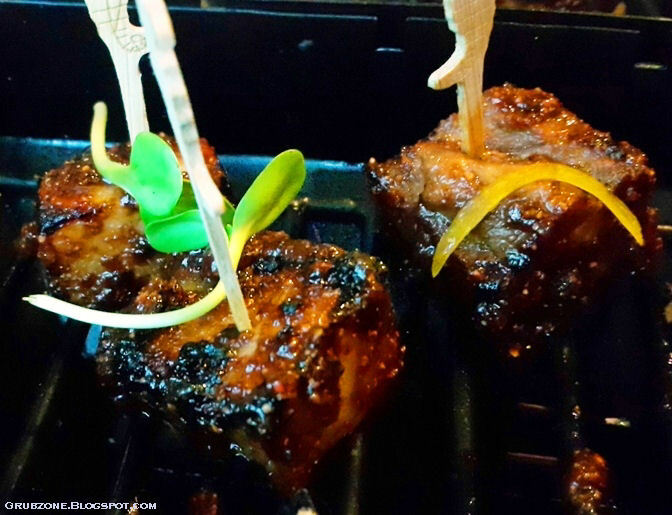 The meat was so soft that even a toothless person could eat it. The minced meat was placed inside a soft burger and tasted like a very flavorsome meat bun. It reminded me of my trip to Hong Kong and the meat buns there. A good eat if you want plain good food without theatrics. Dal Chawal Arancini - Italian arancini balls given an Indian vegetarian twist. These were filled with a stuffing made of rice, lentils, peas and greens. And were topped with a poppadom roll and served with pickle and chutney. Delectable little flavor bombs. 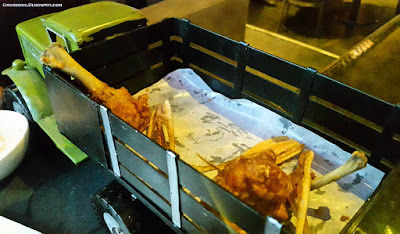 FFC or Farzi Fried Chicken is a play on KFC. One is served a truckload of these drumsticks though the truck is a miniature model ha. The chicken felt a little uninspired, tough and try. This was perhaps the only thing that disappointed me completely. The smoked BBQ cream dip did not help much. 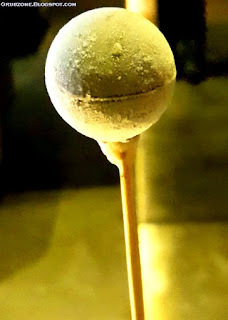 Mishti Doi grapes - Continuing Massive group's love for playing with Mishti Doi (Remember the lollipops at Masala Library) were these grapes made using molecular gastronomy. These grapes would explode in the mouth releasing a sweet flavor of the Mishti Doi. Serves as a good palate cleanser between courses. Bailey's pops were mini desserts made of Irish cream. These would dissolve fast in the mouth suggesting that these were made using Liquid Nitrogen. Decent dessert but gets over too fast. I would rather have a cup with a few of these balls than a pop. Farzi has more dessert options but this was the only one that I could sample that night. First Mate : Oye, follow me mate. We found something interesting from the roof tops. Captain : What are you fellas doing on the roof tops? First mate : We just fought off rogues mate. Thought it would be wise to go to the tallest structure and inspect for any other trouble heading in our direction. Farzi's pricing will be along the lines of Papaya. It will be on the higher side but given the exceptional quality of some dishes and the unique ambiance, the price is well worth the buck. 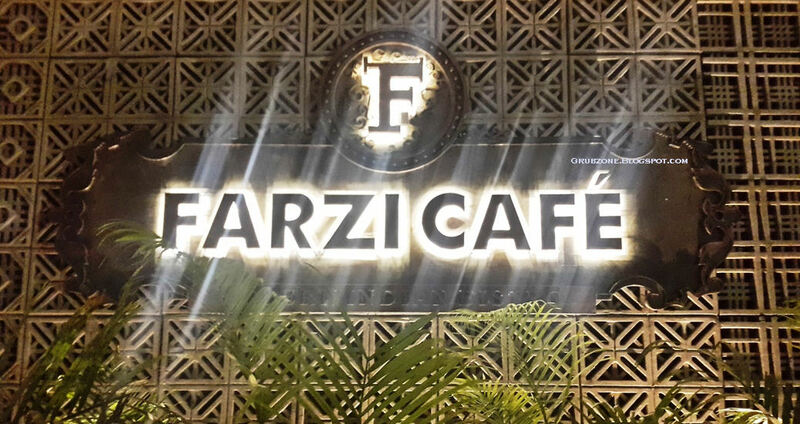 Farzi Cafe has been a big hit in Gurgaon, winning many awards. 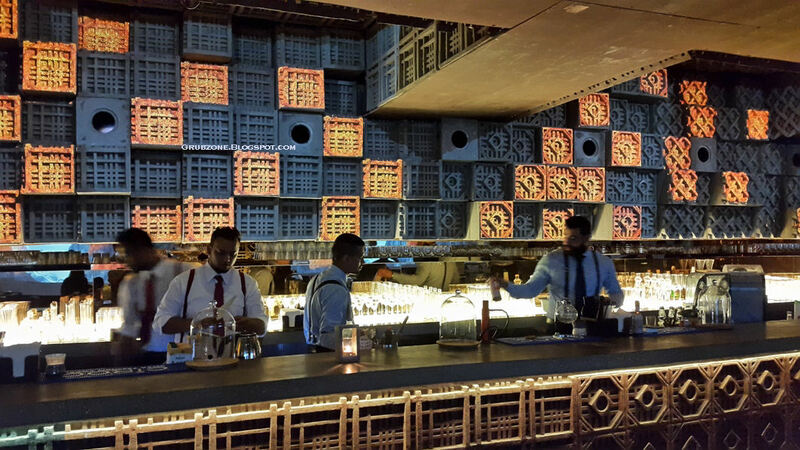 It has now arrived and brought a bit of Delhi's social scene to Mumbai. 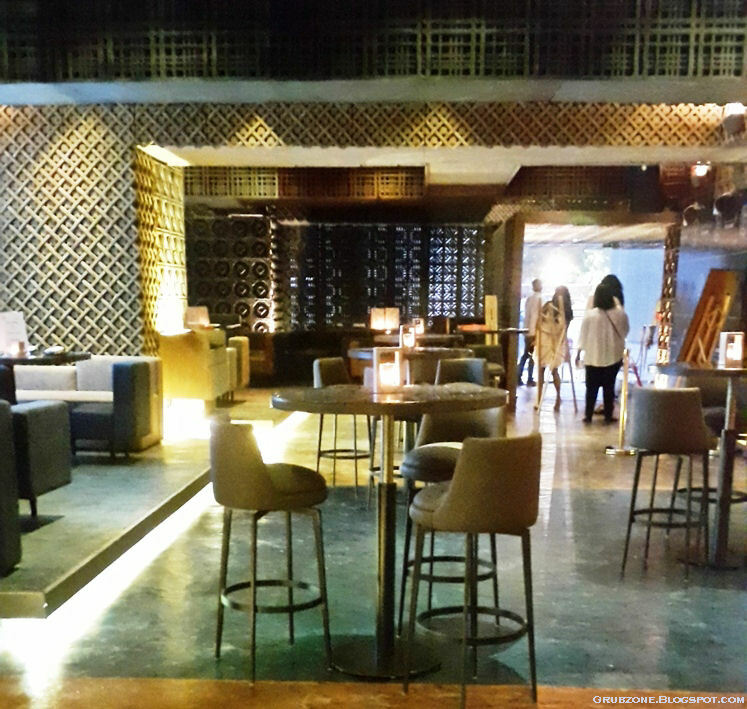 Masala Library and Papaya are already hits with the eat out crowd. Will Farzi complete Massive's hat trick? Lets find out. Farzi Cafe opens to the public on the first week end of May, 2016. Captain(Shocked but sees that he is unhurt) : You are pulling a Jon Snow on me? First Mate : Just messing. Cardboard Knives ha. Captain (awkward silence) : Ok, so why the hell did ya call me up here? Gunner : Look at the lights below. Captain : They collectively seem to form a funny shape. Why? Navigator : Look at the map. That funny shape is marked here. Captain(Brief stern silence) : Hmm. This region...Its the Sea of Shipwrecks. Opa! 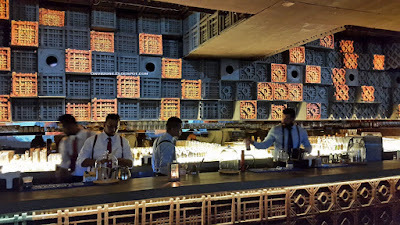 Bar & Cafe - Andheri Airport Road, Mumbai. Lighthouse Cafe - Worli, Mumbai. 1441 Pizzeria - Fort, Mumbai.